Teachers from Curley K–8 School celebrate completing an EiE design challenge. This week is National Engineers Week, an event that aims to get more kids interested in engineering careers. So it couldn't be a better time to announce a new collaboration between the Museum of Science and the Boston-based risk-modelling firm AIR Worldwide (AIR) that will bring the Engineering is Elementary curriculum to six elementary schools in the Boston Public Schools (BPS) system. 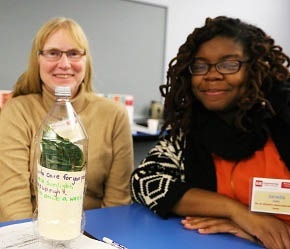 At the workshop, teachers engineered packages to protect a live plant. Thanks to a $15,000 engineering education grant from AIR, 18 BPS educators from six elementary schools (Adams Elementary, Thomas Edison K–8 School, Rev. Dr. Michael E. Haynes Early Education Center, West Zone Early Learning Center, John F. Kennedy Elementary, and Curley K–8 School) attended an EiE professional development workshop at the Museum of Science this past January. Over the course of the day, the teachers got a chance to try several hands-on EiE activities, including engineering a tower from index cards and designing and constructing a packaging system to protect a live plant. They also reviewed the 20 EiE units and chose one to implement in their classrooms. Some will start engineering with their students later this month; others will start in the spring. By the end of the school year, about 300 elementary students will be much more familiar with what engineering is—and what it means to work as an engineer—than they were at the start of the school year. 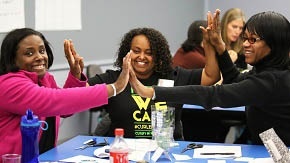 "Many elementary teachers don't feel well prepared to teach engineering and science, so high-quality professional development is a critical need," says EiE director and Museum vice president Christine Cunningham. "By helping Boston elementary teachers build their skills and confidence in teaching engineering, AIR Worldwide is helping to make a difference for local students for years to come." An engineer from AIR helps Museum visitors test their sail designs. One other goal of National Engineer's Week is to get engineers involved in volunteering in their communities and helping to build excitement for engineering. With this goal in mind, a total of 21 AIR engineers are volunteering at the Museum between Feb. 15 and 27. 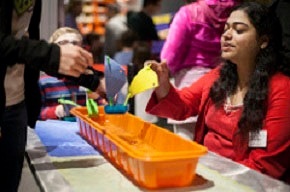 They'll interact with Museum visitors as they participate in special hands-on design challenges scheduled in honor of EWeek, including EiE activities like designing and testing sailboats and engineering earthquake-resistant model buildings. The latter challenge should make the AIR engineers feel right at home, since the company works to help clients all over the world prepare for risks like earthquakes and other natural disasters. If you plan to visit the Museum in the next few weeks, look for these fun engineering activities—and for the AIR volunteers who are lending a hand.